In twenty years as a GP, with a busy practice in Perth, Jean Montrose has come to learn a lot about human nature, and has earned both the respect and the affection of the local community with her brisk efficiency and her kindly commonsense. One rainy morning, after coping with the usual procession of coughs and colds in the surgery, Jean is called out to Lossie House on what turns out to be a far from routine visit. . .
Poor little Magnus Lumsden. Always a sickly boy, he has been found dead in his cot - and not from natural causes. Who could possibly want to kill an innocent baby? Tragically, the finger of suspicion points first of all at Magnus's father, Dempster. A notorious drunk, the future Lord Aviemore has been heard to wish his son and heir dead. And if he has nothing to hide, why has he mysteriously disappeared? His wife, Stella, is devastated, and has to cope with her feelings of guilt about not being in the house at the time. Why had she left her sister Amanda in charge on that fateful day? Detective Inspector Douglas Niven is ill at ease with the upper-class enclave in the immediate neighbourhood of Lossie House, and quickly realises that all kinds of rivalries and passions lurk beneath its well-bred surface. Stella Lumsden is the kind of woman who easily excites both lust and jealousy, but who would choose such a vicious way to get even? Evelyn Ross, with her history of instability? Keith Armstrong, with his violent past? 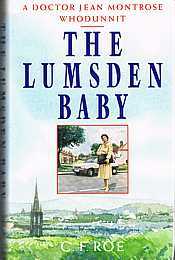 Doug Niven has often relied on Jean's intuition and shrewd analysis of character when his investigations seem to be leading nowhere, but she turns out to have a much more crucial role to play in the case of the Lumsden baby. . . The alternative name of this novel is "A nasty bit of murder "